After five memorable editions, Ro2 Art is proud to present CHAOS!!!!!! 2018, The Sixth Annual Ro2 Art Small Works Show, a curated exhibition of small works featuring over 100 Ro2 artists and guests. The show will run from August 4 through September 8, 2018, with an opening reception held Saturday, August 4, from 7-10pm at Ro2 Art, located at 1501 S. Ervay Street in the Cedars neighborhood of Dallas. ​Ro2 Art’s annual small works show is a powerhouse of creativity. With walls crawling with artwork hung salon-style, the gallery becomes a veritable treasure trove. Whether browsing with purpose or simply enjoying the vibe, both established and emerging collectors and art lovers are free to dive headfirst into the wide array of work to satisfy any desire for distinctive pieces from the region and around the country. CHAOS!!!!!! promises to be a vibrant, expansive exhibition of intimately scaled artworks from a diverse of artists. While most of the exhibiting artists hail from the North Texas region, the show also features a number of established artists from around the US and from Europe. 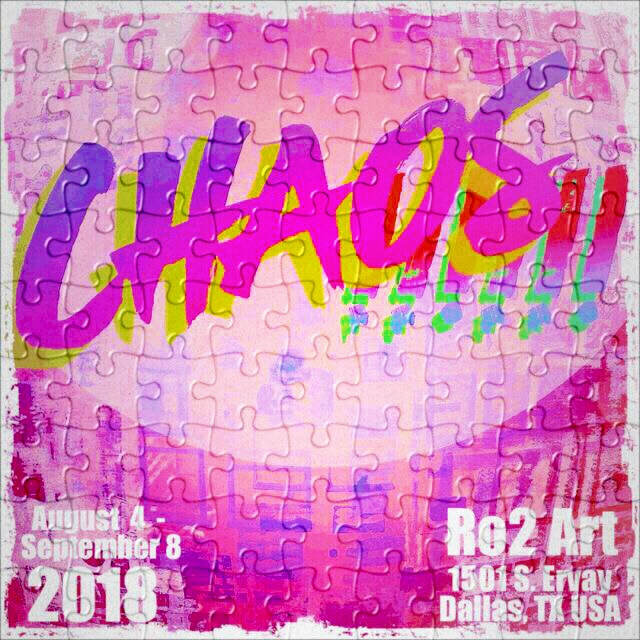 As in previous years, the artists represented by the gallery are joined by invited guest artists, creating a dynamic unique to Ro2 Art's CHAOS!!!!!! exhibition.